Outside Glastonbury Information Centre, amidst the bustle of buses and coaches, stands a slim white pole on a small patch of grass. One of over 250,000 placed around the world this is a Peace Pole, inscribed with the words “May Peace Prevail on Earth” in eight different languages, plus a Braille plate. Standing there for a moment with your hand affords the opportunity to feel the wish of millions around the world that we may all live in harmony despite our diverse lives. In the original Japanese version of May Peace Prevail On Earth, the character for ‘Earth’ includes not only humankind but ‘Life in all Realms of Creation’. When we speak the words, May Peace Prevail on Earth imagine that the frequency and energy field of Love, Peace and Harmony reaches the kingdom of plants animals and all of Creation including our solar system, the cosmos and the Universe at large. The original idea of the Peace Poles came in 1955 from Masahisa Goi who was deeply upset by the devastation of Hiroshima and Nagasaki. Understanding that the vibration of our thoughts is extremely powerful, he hoped messages of peace for the world would spread out from each pole and the positive energy would affect us all. Mr. Goi believed that as more and more people are touched by this prayer and begin to live and act in the spirit of this message, a great transformation would take place in global consciousness, bringing about peace and harmony in our personal lives as well as in the world at large. 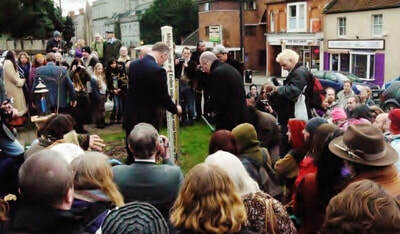 In 2012 Tatomir Ion-Marius, a Romanian Peace Ambassador visited Glastonbury Pilgrim Reception Centre and raised awareness of the Worldwide Peace Pole Project. 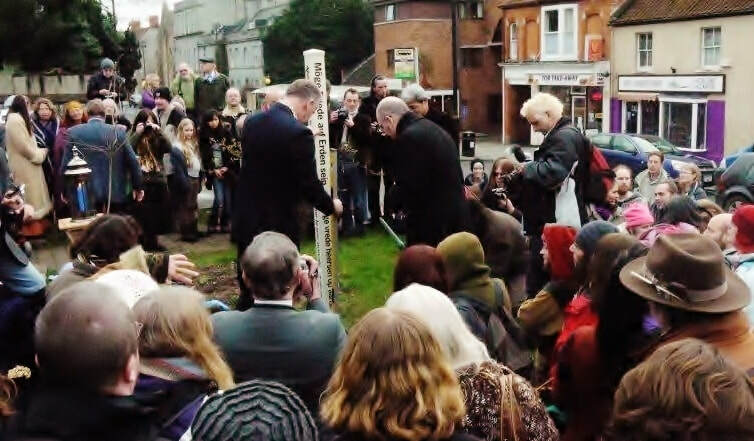 January 26, 2013 saw a day of celebration when the Pilgrim Reception Centre, together with some 200 people, planted our Peace Pole in the heart of Glastonbury. It is still an important place where Peace gatherings take place on the anniversaries of the bombings and at other times during the year. Uma Uchima, from the World Peace Prayer Society, Scotland, UK, helps place our Peace Pole. 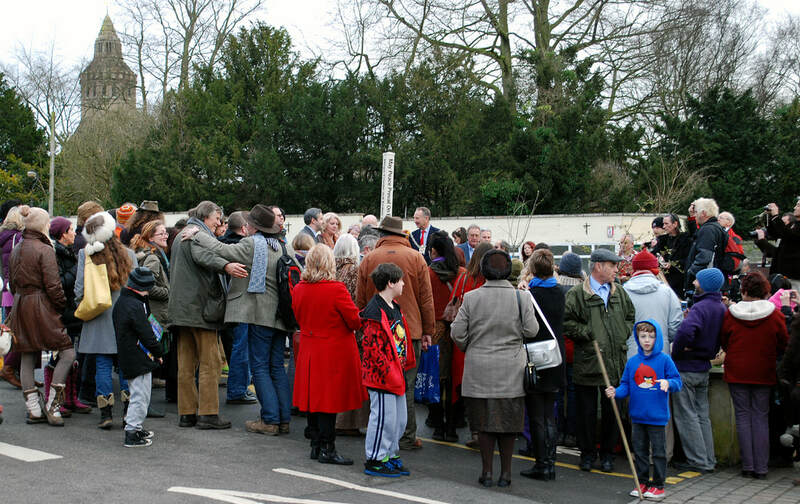 Lots of diverse folks from the Glastonbury community turned out for the day. What did members of the Community have to say about the day? "What an amazing day. SO important for the town, historically and spiritually."